- "Balance of risks are for further political turbulence" say ING. - But "hawkish" BoE will spur swift recovery once into 2019. - Others see GBP gains, and more rate rises, coming sooner. The British Pound remains on course to return toward its post-referendum lows against the Euro and Dollar despite a "hawkish" Bank of England that delivered its second interest rate rise in the last year Thursday, according to strategists at ING Group. This is because monetary policy and macroeconomic fundamentals are expected to take a back seat over the next nine months as the ebb and flow of the Brexit negotiations, uncertainty over the final outcome and the prospect of an all-out meltdown in domestic politics remain front and centre for markets. Thursday's decision "has no major implications to our GBP view," says Viraj Patel, a FX strategist at ING. "We continue to think the Pound will remain under pressure in the near-term as the currency continues to price in a significant degree of political uncertainty. We do feel the balances of risks are for further political turbulence between now and October." The Bank of England raised its interest rate by 25 basis points to 0.75% Thursday, marking only the second increase in Bank Rate since the financial crisis, but also a second within the last year. It's previous rate rise, to 0.5%, came in November 2017. BoE officials cited inflation that is expected to remain above the 2% target for the duration of the Bank's forecast horizon as grounds for the decision and raised their economic growth and inflation forecasts in the Bank's quarterly Inflation Report. They project the consumer price index will rise to 2.5% by September 2018 before falling to 2.2% by the same time in 2019, 2.1% by the same time in 2020 and 2% by the end of September 2021. It is currently at 2.4%, down from 3% in January 2018. "Conditioned on the gently rising path of Bank Rate implied by current market yields, CPI inflation remains slightly above 2% through most of the forecast period, reaching the target in the third year... an on-going tightening of monetary policy over the forecast period would be appropriate to return inflation sustainably to the 2% target at a conventional horizon," the BoE says, appearing to hint that further rate rises are in the cards over the next two years. Above: The initial reaction by Sterling was to shoot higher, but a sudden change in heart by the market left it nursing losses. 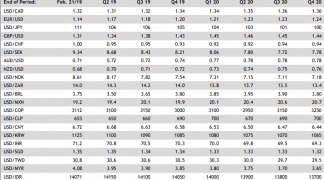 The Bank also tweaked its GDP growth forecasts, with the economy now expected to grow by 1.8% in 2019, not the 1.7% it previously projected. Steady GDP growth, as well as the economy's "diminished supply potential" in the wake of the Brexit vote, mean there will a small margin of "excess demand" in the economy by 2020, which would be inflationary. Changes in rates, or hints of them being in the cards, are only normally made in response to movements in inflation but impact currencies because of the push and pull influence they have on international capital flows and their allure for short-term speculators. "The Bank of England has hiked rates and the hawkish tone of the statement has taken markets slightly aback. But despite the Bank's optimistic outlook, we think policymakers will find it tricky to hike rates again before Brexit. We don't expect another rate rise before May 2019," says James Smith, a developed markets economist and colleague of Patel at ING Group. Smith goes on to say the BoE may be looking to raise rates faster and further than markets currently give it credit for, given its latest forecasts for inflation and economic growth, but that Brexit may prevent it from doing this. The Bank's forecasts are all contingent on the UK avoiding a disorderly and "no deal Brexit", so any bet on interest rates by traders is also effectively a wager on the outcome of the Brexit talks. "We have pencilled in a 1.27-1.28 trough for GBP/USD to reflect peak ‘no deal’ Brexit risks (EUR/GBP risks moving up to 0.91-0.92). However, a relatively more hawkish BoE may curb some of the potential downside GBP risks and we still remain medium-term bulls, looking for GBP/USD at 1.38-1.40 and EUR/GBP at 0.85-0.86 in 1Q19," says Patel. Patel's projection for a EUR/GBP rate of 0.91-0.92 in the third quarter is the same as forecasting a 1.0869 to 1.0989 bottom for the Pound-to-Euro rate. Likewise. 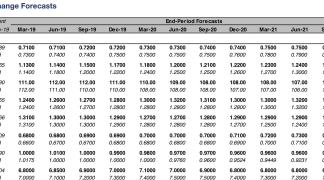 the projection of a 0.85-0.86 EUR/GBP range in early 2019 is the same thing as forecasting a Pound-to-Euro range of 1.1627 to 1.1764. As much as the ING FX team have a negative outlook for the Pound over the next five months or so, they forecast a swift recovery during the early stages of 2019, based on the assumption a "politically acceptable" agreement covering the UK's exit from the EU is struck and markets are able to refocus on current UK economic fundamentals. Others see a recovery to 1.40 for the Pound-to-Dollar rate, and presumably a similar performance from the Pound-to-Euro rate, coming sooner than that. "We still forecast that rates will rise more quickly than is implied by markets, helping to push sterling back towards $1.40 by the end of the year (from $1.31 now). Investors appear to be expecting virtually no more tightening this year or next, whereas our forecast is for three more 25bp rate hikes in that time as the UK economy holds up fairly well," says Ruth Gregory, a senior economist at Capital Economics. Gregory's forecast is for the UK's main interest rate to sit at 1.5% by the end of 2019 and 1.75% by the time the curtain closes on 2020. She says this forecast is consistent with the BoE's guidance that rate rises will be gradual, limited and that monetary policy would still remain accommodative for the economy. It is also implies rates will rise substantially faster than the market currently expects. 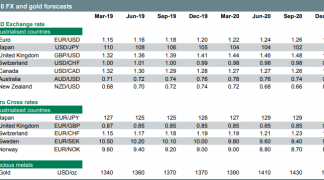 Pricing in overnight index swaps markets, which enable investors to protect themselves against changes in rates but also provide insight into expectations for monetary policy, implied a March 21, 2019 Bank Rate of just 0.81% before the announcement Thursday. 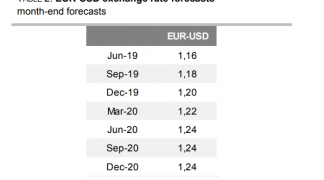 ING's Patel observes these odds "barely budged" after the meeting, which suggests markets see only a minimal probability of another interest rate rise before the UK leaves the EU, yet Gregory's forecast includes one more rate rise this year. If the BoE were to signal it might raise rates before then, the Pound would likely receive a powerful tailwind of support. Underpinning Sterling and working against the Brexit gloom is the upgrade to forecasts for inflation and growth contained in the Inflation Report. The August Inflation Report shows forecasted growth for the third-quarter 2018 has been upgraded to 1.5% from 1.4%, while third-quarter 2018 growth forecasts are raised from 1.7% to 1.8%. The third-quarter 2018 inflation forecast is raised from 2.4% to 2.5% while the third-quarter 2019 inflation forecast is raised from 2.1% to 2.2%.